Seagrass is relatively easy to maintain, as long as it doesn’t come into serious contact with its potential kryptonite – water! The hard, natural vegetable fibers don’t attract dust, and bacteria can’t penetrate the fibers. Sand and fine dirt do not damage seagrass as they do many conventional floor coverings; the soil filters through the weave and comes out the other side, rather than sitting on or getting ground into the surface. Regular vacuuming with a strong brush-suction is all you need to do to care for seagrass rugs or carpet. Beater-type cleaners are not as effective due to the fabric weave – the strong suction of a vacuum pulls out fine dirt whichaccumulates between the fibers and underneath. Although dirt may not be obvious, frequent vacuuming will increase carpet life by any nasty build-up, and will help get rid ofstains caused when spilled liquids dissolve un-vacuumed dirt and dust. In dry areas with low humidity, a frequent, light and even application of water strengthens natural fibers and improves its resistance to wear. This is easily done by spraying clean water evenly over the surface with a spray bottle. This dampening can also help eliminate minor bubbling and looseness, as the fibers will tighten up slightly as they dry. Seagrass carpets dry quickly. Under no conditions should the carpet be saturated, as irreversible warping can easily result when sisal is saturated with any liquid, as well as possible staining from dyes or dirt in the underlay. 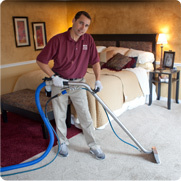 Be sure that the carpet is vacuumed and clean before misting with water. 1. Mop up the spill immediately with an un-dyed paper towel or clean un-dyed cloth. 2. Brush or sponge the discolored area with small amounts of detergent or carpet shampoo and lukewarm water. The cleaner should have a neutral pH factor. Do not saturate. Blot up with un-dyed paper or cloth. Repeat. 3. Dry the carpet quickly, as with a hair dryer. 1. Scrape up cautiously as much of the stain as possible, using a dull knife or nail file. Soot should be vacuumed up. 2. Dampen a clean, un-dyed white cloth with a small amount of dry cleaning fluid. Tetra and petroleum solvents may be used. Blot up the stain. Check to see if solvent is dissolving the substance. Work towards the center of the stain and don’t use too much solvent to avoid spreading the stain. Repeat. Greasy and oily spots have also been successfully removed from seagrass with aerosol can spot removers, such as K2R (available in most drug stores). Follow the directions on the container. These contain both a cleaning solvent and absorbing powder.